Does this scene fill you with terror? Women in their forties are more likely to have dental anxiety than any other age group according to a University of Sydney study into dental anxiety and phobia. The case-control study, now entering its fifth year, aims to help improve dental management for patients with dental fear, dental anxiety and dental phobia. It has found women in this age group are most likely to have perceived a traumatic dental experience, abuse, trauma and oro-facial trauma. They are also more likely to have higher levels of depression, general anxiety or suffer from stress. Character traits of perceiving pain in alarmist ways (catastrophising responses) and poor coping with pain have strong correlation with dental anxiety. University of Sydney Faculty of Dentistry Special Needs Dentist, Dr Avanti Karve, who is co-ordinator of the study, admits that for some the very mention of the word 'dentist' can evoke an instantaneous response of dread. "Dental anxiety is very real and complex and it should never be downplayed," says Dr Avanti Karve. "To date despite all the advances in the dental field, dental fear is reported in up to 40 percent of the western population. A recent national telephone survey found that a person with severe dental anxiety waits on average 17 days to make an appointment when in severe pain, as opposed to three days in the remaining population." According to Dr Karve the key to alleviating and managing this fear is to take the focus away from our teeth, and review the whole person. For the last five years, Dr Karve has been coordinator of the Dental Phobia Clinic at the Westmead Centre for Oral Health where the clinical team's approach includes a dietician, psychologist, sedationist and anaesthetist. "At the centre we work with each patient to explore the history of their anxiety, identify specific triggers, and attempt to provide each individual with coping skills to manage their fear. We also look at underlying factors of dental disease and poor general health, and aim to improve diet and lifestyle factors. In fact our first consultations at the Phobia Clinic are not even conducted in a dental chair," Dr Karve says. Dean of the Faculty of Dentistry Professor Chris Peck says regular visits to your dentist are part of a good oral health strategy where the focus can be on prevention rather than surgical intervention. 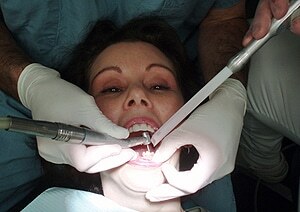 This will of course help allay any fear related to visiting your dentist, Professor Peck says. "More and more, medical research is linking poor oral health with conditions such as diabetes, heart disease, nutritional deficiencies and obesity so it is important that we feel comfortable visiting our dentists. Going forward, we want to investigate the relationship between pain perception, pain coping and dental anxiety, and measure the success of pharmacological and non-pharmacological treatment approaches" Professor Peck says.